If you want to succeed in the business world, you better start reading: Bill Gates, once the wealthiest man in the world, famously reads about 50 books each year. Warren Buffet, the chairman and CEO of Berkshire Hathaway, stated that reading 500 pages per day was the key to success. When asked how he learned to build rockets, Elon Musk, the CEO of SpaceX, responded, "I read books." As a business student, you can expect to read hundreds of books, articles, and blog posts. To help guide you through the wealth of information, we provide a list of 25 must-read books invaluable for future Fortune 500 CEOs and small business owners alike. This ranking draws from both classical economics and modern management theory. It includes books about corporate case studies and books that examine leadership in battle and in business. Books can teach you why some organizations grow and thrive and why others fail. This list represents the collective advice of some of the greatest thinkers and business leaders in history. With more than four million copies sold, Jim Collins' "Good to Great: Why Some Companies Make the Leap...and Others Don't" reaches audiences far beyond aspiring business leaders. The book's research-based lessons on leadership and management apply to any industry, and Collins possesses a gift for distilling complex information into easily understood characteristics of success. For example, the book calls on organizations to find "Level 5 Leaders," or those who combine humility with a desire to do what's best for the company rather than themselves. It articulates the importance of finding the right people generally rather than the right person for a particular role. It encourages organizations to create environments where employees confront brutal truths without losing hope. It also creates a framework for direction-setting by asking readers to consider their passion, ability, and marketability. "Good to Great" tops this list because of its broad appeal, readability, and the foundational nature of the topics it covers. Originally published in 1936, Dale Carnegie's "How to Win Friends and Influence People" continues to offer relevant guidance on both personal and professional relationships. Whether you want to close a sales deal, hire a new employee, or simply broaden your social circle, this book can help position you for success. Carnegie offers common sense advice, like smile when meeting new people, remember their names, and listen well. As the book goes on, however, he provides deeper insight and more complex guidance, including how to sincerely make another person feel important and start a debate by emphasizing what you hold in common rather than the differences between your positions. Hailed by business leaders like John Rockefeller and Warren Buffet, "How to Win Friends" can help you learn how to better understand another person's perspective, an absolutely critical skill in the business world. First published in 1776, Adam Smith's "The Wealth of Nations" remains one of the most important texts in economics. The book examines production and consumption in the context of the early days of the Industrial Revolution. At the time, it offered some of the earliest scholarly insight into subjects like productivity, the division of labor, and free markets. Perhaps most famously, Smith introduces the analogy of "the invisible hand" to describe how market forces bring demand and supply of goods into equilibrium in truly free markets. This and other ideas helped revolutionize not only economics but also political science and mathematics. Scholars cite "The Wealth of Nations" more than any other social science text, with the exception of Karl Marx's "Capital." To fully understand how individuals and businesses operate today, you should consider reading the book that helped lay the foundation of capitalism and the modern economy. In "The Big Short: Inside the Doomsday Machine," Michael Lewis offers a cautionary tale of free markets run amok. The book details the U.S. housing bubble of the early 2000s and the related financial crisis of 2007 and 2008, considered by many to be the greatest period of financial instability since the Great Depression. "The Big Short" focuses on the exploits of a small group of financial professionals who created a credit default swap market in order to effectively bet against the collateralized debt obligation bubble. As the book progresses, Lewis also highlights individuals and companies that lost billions of dollars in the market crash and the toll the financial crisis took on the American public. Using humor and ingenious analogies, the book gives even those without a degree in business the ability to understand how a poorly regulated system collapsed. Sheryl Sandberg, the chief operating officer of Facebook, penned "Lean In" to chronicle her own rise to the top of the business world and offer advice to other women about how to follow in her footsteps. Though the book received its share of criticism, it remains a powerful source of guidance and inspiration for women and men alike. Sandberg begins the book by explaining how society prizes ambition in men but not in women. She then encourages women to accept compliments about their accomplishments, to sit at the table, and to downplay feelings of inadequacy. Among other pieces of invaluable advice, "Lean In" discusses the importance of finding a professional mentor, of finding a partner who can share parenting responsibilities, and of speaking out against sexism in the workplace. Especially for those who want to experience the joys of both a career and family, "Lean In" serves as an essential read. In "Thinking, Fast and Slow," psychologist Daniel Kahneman outlines a transformative thesis. According to his research, humans think in two distinct ways: what he calls "System 1" involves fast and emotional responses, while "System 2" comes with greater deliberation and more logical analysis. Both modes of thought offer advantages, but we often do not understand when to use one system or the other. The books holds enormous implications for business professionals. Most of us instinctively use System 1 thinking given how much more effort System 2 thinking requires. However, System 1 thinking does not allow us to grapple with complex systems and often leads to overconfidence. For example, when faced with the decision of whether to invest in a particular stock, we may feel drawn toward relying on our intuition or using only one or two indicators to guide our thought process. Rather than convincing ourselves that System 1 thinking suffices in these situations, we must intentionally slow our thinking. Like "How to Win Friends and Influence People," Stephen Covey's "The 7 Habits of Highly Effective People" straddles the line between business and self-help book. Broadly speaking, the book emphasizes the importance of both ethical means and ends. The seven habits include working proactively toward your goals, envisioning your future in order to define your present, understanding and implementing the concepts of importance and urgency, finding mutually beneficial solutions, prioritizing understanding, building productive teams, and finding a personal way to sustain your energy and passion. A common thread running through the book entails the need for an abundance rather than scarcity mindset, or the idea that we can win without others losing. Many in the business world apply this idea through profit sharing initiatives and corporate sustainability efforts. With more than 25 million copies sold around the world, "The 7 Habits of Highly Effective People" rarely fails to make a list of books essential to business success. Eric Ries worked in several roles at startup organizations, including employee, founder, adviser, and venture funder. He shares the lessons he learned in his book "The Lean Startup," which offers entrepreneurs a detailed plan to create successful and innovative new businesses. Ries believes that the key to startup success involves an early and deep understanding of what the customer wants. To gain this information, he suggests engaging potential customers in interviews and in research discovery. Once a company garners enough information to create a "minimum viable product," the firm should begin producing that good or service while testing extensively. Many organizations, Ries contends, strive for initial perfection when iterating quickly based on feedback often proves more efficient. While largely written for entrepreneurs, large companies like Dropbox and General Electric also use the approaches laid out by Ries. Regardless of your career path, you can benefit from the wisdom of "The Lean Startup." Harvard professor and business consultant Clayton Christensen helped revolutionize business by introducing the concept of "disruptive innovation" in his 1997 book "The Innovator's Dilemma." The book routinely receives mention as one of the most influential business texts of the 20th century, and it spawned dozens of follow-up works and critical responses. Essentially, disruptive innovation creates a new market and fundamentally alters an existing market. For example, before the invention of the telephone, most long-distance communication took place over telegraph wires. Western Union, one of the largest providers of telegraph service in the U.S., declined to enter the emerging telephone market because they felt they could make more money by investing further in telegraph infrastructure. Very quickly, telephone technology advanced enough to almost completely eliminate the telegraph market. Western Union, like many large companies before and since, struggled to deal with disruptive innovation. Warren Buffett boasts a net worth of more than $84 billion. In a style both highly readable and intensely informative, Buffett offers advice on how he came to build his fortune through disciplined investing. For example, the book encourages readers to avoid investing in a given stock, focusing instead on the company behind the stock. This advice may seem like common sense, but it underscores how little investors know about the companies in which they invest. Buffett also suggests that readers seek out companies with a "durable competitive advantage," arguing that these companies see long-term growth in value even if their stock prices fluctuate in the short-term. Originally published in 1995, more recent editions include letters and essays from other business leaders extolling the value of Buffett's advice, cementing this collection's place on this list of best business books. According to management consultant Peter Drucker, the measure of an effective executive amounts to "the ability to get things done." Using that metric, Drucker lays out what he believes counts as the five most essential characteristics of effective leaders: managing time, choosing what to contribute to an organization and in what way, knowing where to mobilize strength for the greatest effect, setting appropriate priorities, and employing effective decision-making. "The Effective Executive" uses case studies from both the government and the private sector to illustrate how leaders with these characteristics succeed and those without them fail. While some of the examples may feel dated, the underlying lessons remain timeless. Jack Welch, the former chairman and CEO of General Electric, considered himself a "disciple" of Peter Drucker and required many of his executive to read Drucker's work. If you aspire to become an effective executive, you should follow suit. 12 In Search of Excellence: Lessons from America's Best-Run Companies Author: Thomas J. Peters and Robert H. Waterman Jr.
Thomas Peters and Robert Waterman Jr. set out to find examples of excellence in American business. After studying more than 40 cases of highly effective companies, the two authors wrote this book detailing the eight principles of management that they believe make firms successful. 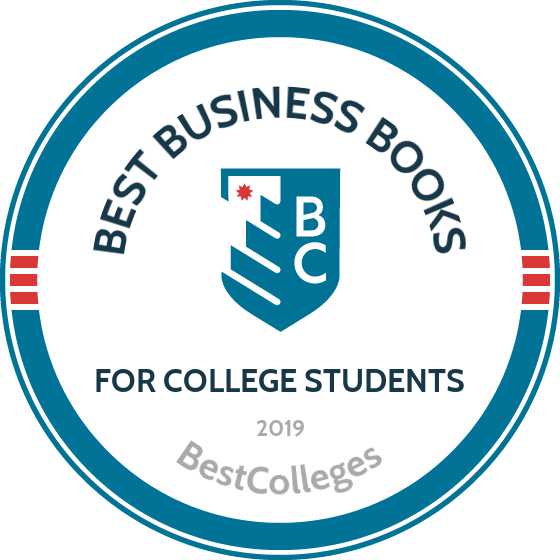 Once named "the greatest business book of all time," the work "In Search of Excellence" offers invaluable management and leadership insight to college students majoring in business. For example, Peters and Waterman point to a "bias to action" as one of the hallmarks of an excellent organization. Rather than wait for new information or a change in circumstances, leaders of these companies seek to learn by doing. This emphasis on iteration and ongoing assessment echoes many of the other books on this list, some of which draw directly from the exhaustive research conducted for "In Search of Excellence." Though not a book about business, "The Art of War" has influenced generations of business leaders. Written by the ancient Chinese military strategist Sun Tzu, the book includes 13 chapters, each devoted to a specific facet of warfare and its accompanying tactics and strategies. The book covers topics like how to plan for military engagements, how to exploit an enemy army's weaknesses while playing into your own army's strengths, and how to build an army so that it can respond to shifting circumstances. Because much of "The Art of War" focuses on the aspects of war outside of actual combat, the lessons can apply to other disciplines, like business. For example, the parts of the book that emphasize the need to gather intelligence about your enemy can easily translate to business negotiations. Sun Tzu also defines strength as unity rather than size, a key principle in management theory. The first few months as a new leader can make or break your long-term chances of success in the role. In "The First 90 Days," Michael Watkins lays out strategies for taking advantage of the opportunities afforded by a leadership transition. For example, the book begins with a discussion about the importance of securing early wins to build the political capital necessary to enact larger changes. Other pieces of advice include establishing integrity, becoming a "historian" of your new organization, and asking the same set of questions during all informational interviews with your new staff. Written more as a practical guide than as a theoretical text, each chapter in "The First 90 Days" ends with a checklist of key concepts and takeaways, practical tools for implementing the lessons learned in that chapter, and a self-assessment to help new or aspiring leaders understand whether they possess the skills and knowledge necessary to succeed in certain scenarios. In October of 2001, the public learned that executives at Enron, an American energy company, used accounting loopholes and poor financial reporting to mask billions of dollars in debt. Enron stock, valued at roughly $90 in the mid-2000s, plummeted to less than $1 by November of 2001, and the company declared bankruptcy before the end of that same year. In "The Smartest Guys in the Room," Bethany Mclean and Peter Elkind document the precipitous fall of Enron. Using interviews and details gleaned from performance reviews, calendars, and emails, the two authors paint a detailed picture of how the senior leaders of the company engaged in fraud -- ultimately costing many of their own employees their pensions and life savings. While many of the books on this list pay homage to the ambition and drive necessary to succeed at the highest levels of business, "The Smartest Guys in the Room" shows how easily these characteristics can corrupt. Most small businesses end in failure, and Michael Gerber knows why. In "The E Myth Revisited," Gerber argues that while individuals with strong technical skills but little managerial experience often enjoy initial success when starting a new business, they fall victim to burnout when they fail to transition into a supervisory or leadership role. Written as a hypothetical conversation between Gerber and a would-be bakery shop entrepreneur, the book tracks the process of launching a new venture from infancy to maturation. Through this framework, Gerber explores the myth which states that entrepreneurs start new businesses to make a profit. In Gerber's opinion, people become entrepreneurs, whether they know it or not, to gain more freedom in their lives. By embracing this reality, small business owners can learn to let their business become a part of their life rather than its sole purpose. Widely known as the "father of value investing," Benjamin Graham wrote two books that helped shape investing in the 20th century: "Security Analysis" and "The Intelligent Investor." The latter text laid the groundwork for value investing, or the purchasing of financial assets that appear underpriced through some form of financial analysis. Graham wrote "The Intelligent Investor" for lay audiences, using clear language, simple examples, and effective comparisons to share the lessons he learned as an investor and economist. He primarily advocated for rational investing, using data and discipline as bulwarks against emotional responses to upturns and downturns in the market. All investors, whether business students or established professionals, can benefit from a reminder of the simple wisdom of Graham's approach. Later editions include commentary to update the book's content. In "The Fifth Discipline: The Art and Practice of the Learning Organization," Peter Senge charts a path for companies aspiring to become true learning organizations. By this, Senge means organizations that foster individual and group aspiration, encourage and provide space for reflective conversation, and understand complexity. Called one of the most important management books of the last 75 years by the Harvard Business Review, "The Fifth Discipline" uses systems theory to illuminate a wealth of lessons regarding the function of organizations. For example, Senge argues that trying to change a system from the outside only results in the system pushing back equally hard. Instead, leaders must help systems learn to change themselves. In addition, Senge warns that organizations that believe they can learn from experience alone delude themselves and must create opportunities for intentional learning so lessons can take root. Much like "The Big Short" and "The Smartest Guys in the Room," Andrew Ross Sorkin's "Too Big to Fail: Inside the Battle to Save Wall Street" serves as a cautionary tale, though this time on a more systemic level. The book chronicles the 2008 financial crisis, as told from the viewpoint of Wall Street CEOs and government regulators. The title of the book refers to institutions so large and interconnected that if they failed, entire segments of the economy might fail alongside them. In an attempt to avert that kind of scenario in 2008, government regulators pushed for the creation of the Troubled Asset Relief Program, or TARP. While TARP did stave off a global financial collapse, the book ends by stating that banks continued to grow and merge without having addressed the underlying causes of the financial crisis. In other words, banks remain too big to fail but with no incentive to alter their behavior because of the assumption of government intervention. A New York Times bestseller, "Barbarians at the Gate: the Fall of RJR Nabisco" details the leveraged buyout of RJR Nabisco in 1988. Written by investigative journalists Bryan Burrough and John Helyar, "Barbarians at the Gate" has been called one of the best business books and serves as a preeminent example of corporate greed during the 1980s. The book details F. Ross Peterson, then CEO of RJR Nabisco, and his attempts to buy out other company shareholders. These plans set off a chain reaction of other investors and private equity companies participating, leading to a bidding war for RJR Nabisco stock. Ultimately, a global investment firm seized control, but RJR Nabisco acquired massive debt in the process. Johnson left the company the next year with approximately $60 million in "golden parachute" compensation. Malcolm Gladwell's "The Tipping Point: How Little Things Can Make a Big Difference" has sold more than 2 million copies since its 2000 publication. The book compares the rise of sociological phenomena to the spread of viruses, arguing that ideas and behaviors spread rapidly under certain conditions. Gladwell points to three rules of sociological "epidemics." First, influential and well-connected people must propagate the idea at an early stage. Second, content must prove "sticky," or memorable in some way. And third, environments must encourage, or at least not actively discourage, the behavior or message. Although written to introduce general audiences to psychological and sociological concepts, the book influences business practice, most notably marketing operations. In the age of viral marketing, business students should pay close attention to Gladwell's lessons about creating messages that spread quickly through a population. Josh Kaufman puts forward a controversial argument in "The Personal MBA." According to his research, paying for graduate school almost never results in a positive return on your investment. Instead, he advocates for aspiring business leaders to skip the MBA and learn what they need to succeed without spending a penny on tuition. Even if you do plan to attend business school, Kaufman's book can provide a good overview of the principles you can expect to encounter during your studies. It covers the forces that limit the size of markets and offers guidance on how to find larger, underserved markets. It details how business owners can create value for their customers beyond products and services. It also explores how to set prices to maximize profitability. "The Personal MBA" introduces an alternative path that may appeal to some students unsure of whether to continue their education after college. In 1998, Seth Godin sold his company Yoyodyne to Yahoo! for $30 million and became Yahoo! 's vice president of direct marketing. In his book "Tribes: We Need You to Lead Us," Godin shares the lessons he learned during his tenure as a dot-com executive. He describes the tribes throughout history and details how the internet allows new tribes to form. However, while the internet provides an unparalleled mechanism to bring people together, it cannot provide leadership. Leadership, even in the digital age, still requires a human touch. Godin goes on to illustrate what he considers important aspects of leadership in modern society, including curiosity, a willingness to upset the status quo, and a desire to cultivate other leaders in service of your cause. Economist Steven Levitt and New York Times journalist Stephen Dubner mixed history, pop culture, and economics to create "Freakonomics: A Rogue Economist Explores the Hidden Side of Everything." The book was tremendously successful, selling more than 4 million copies within the first four years of its publication. It also led to a sequel, podcast, blog, and movie. In "Freakonomics," Levitt and Dubner bring economics to bear on subjects traditionally not explored by that discipline, including cheating among sumo wrestlers, the ability of a bagel shop to predict white collar crime, and the socioeconomic impact of what a person names their child. At its heart, economics represents a study of incentives, and business students would do well to gain a greater understanding of the complex incentives that drive their customers, employees, and competitors. "Freakonomics" provides a humorous and informative entrypoint into the world of economics. In "The 4-Hour Workweek: Escape 9-5, Live Anywhere, and Join the New Rich," entrepreneur Timothy Ferriss asks: what if you could work only four hours per week and enjoy the benefits of retirement now? To do so, Ferriss encourages his readers to limit their business-related communication, outsource tasks to virtual assistants, and focus on the most productive elements of their work. Though he admits that some people must be physically present at their jobs every day, he offers suggestions on how to work remotely or negotiate with your employer to increase time spent away from the office. The book receives both criticism and praise for its depiction of work as simply a means to support other parts of one's life. Even if you do plan to devote more than four hours each week to your job or business venture, "The 4-Hour Workweek" can help you think more deliberately about what you value and how you spend your time. In creating this list, we included books with widespread influence as measured by sales, formal citations, and references from prominent business leaders. We look at the author's reputation in their field, either as a business scholar or an accomplished professional. We consider issues of accessibility and reading level, with a particular focus on books that help build a foundation of knowledge for college students majoring in business. Finally, we focus on diversity, both in topics covered and in viewpoints expressed.